the monthly Quaker magazine where it first appeared. Julie Cadwallader-Staub grew up in Minnesota with five sisters, her parents and a dog, beside one of that state's small lakes. Her favorite words to hear growing up were, ?Now you girls go outside and play.” She now lives in Vermont and still loves to explore the natural world out her back door. 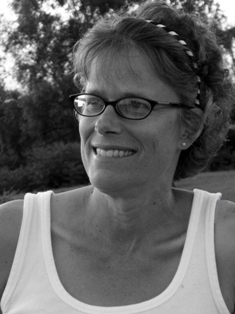 Julie's poems have been published in a number of journals and magazines, and included in anthologies such as The Cancer Poetry Project and Garrison Keillor's Good Poems: American Places. She was awarded a Vermont Council on the Arts grant for poetry in 2001. Julie's first collection of poems, Face to Face, will be published by Cascadia Press in 2010. Learn more about her at www.juliecspoetry.com. I like this uplifting poem; it is reassuring. I love the way your insects click open. The Friends are good. What a lovely poem. It brought back memories to me of me and my sister on our front porch after dark in the summer. There have been so many fewer fireflies these past few decades, and this year I have been seeing more of them again--the poem takes me back in time, brings me home in its own way.